Image courtesy Trent Schindler, NASA Goddard Space Flight Center Scientific Visualization Studio. Caption by Holli Riebeek. For a long time, it seemed that Antarctica was immune to global warming. Most of the icy southern continent, where temperatures can plummet to minus 80 degrees Celsius (-112 degrees Fahrenheit), seemed to be holding steady or even cooling as the rest of the planet warmed. But a new analysis of satellite and weather station data has shown that Antarctica has warmed at a rate of about 0.12 degrees Celsius (0.22 degrees F) per decade since 1957, for a total average temperature rise of 0.5 degrees Celsius (1 degree F). This image, based on the analysis of weather station and satellite data, shows the continent-wide warming trend from 1957 through 2006. 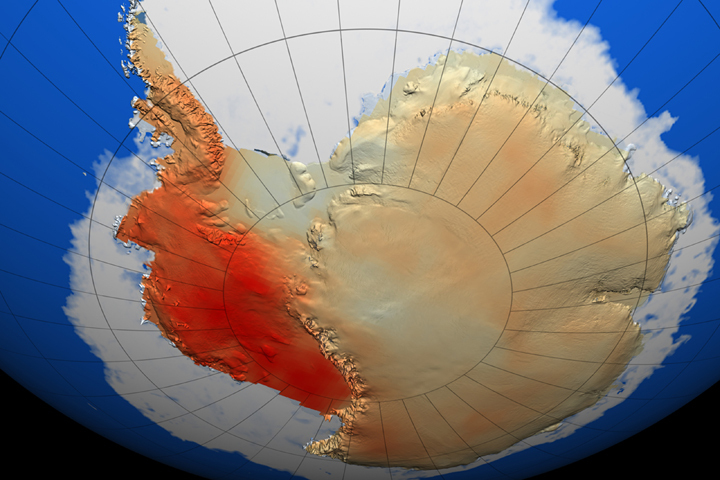 Dark red over West Antarctica reflects that the region warmed most per decade. Most of the rest of the continent is orange, indicating a smaller warming trend, or white, where no change was observed. The underlying land surface color is based on the Landsat Image Mosaic of Antarctica (LIMA) data set, while the topography is from a Radarsat-based digital elevation model. Sea ice extent in the Southern Ocean surrounding the continent is based on data from the Advanced Microwave Scanning Radiometer for EOS (AMSR-E) collected on May 14, 2008 (late fall in the Southern Hemisphere). The image paints a different picture of temperature trends in Antarctica than scientists had previously observed. Limited weather station measurements had recorded a dramatic warming trend along the peninsula, which juts into warmer waters in the Southern Ocean, but the few stations that dotted the rest of the continent reported that temperatures there had not changed or had cooled. It has been difficult to get a clear picture of temperature trends throughout Antarctica because measurements are so scarce. Few weather stations exist, and most of these are near the coast where they are relatively accessible. These coastal locations left vast regions of the continent’s interior where the temperature has never been monitored routinely. Satellites can measure the ground temperature of the entire continent, but only on clear days, when clouds don't obscure the view. Since satellite measurements are always taken in the same sort of weather conditions, they can be skewed. Eric J. Steig (University of Washington), David P. Schneider (National Center for Atmospheric Research), Scott D. Rutherford (Roger Williams University), Michael E. Mann (Pennsylvania State University), Josefino C. Comiso (NASA Goddard Space Flight Center), and Drew T. Shindell (NASA Goddard Institute for Space Studies and Columbia University) collaborated to combine the day-to-day accuracy of weather stations with the continental coverage of satellite measurements. Led by Steig, the team compared 26 years of temperature measurements from the Advanced Very High Resolution Radiometer (AVHRR), a satellite sensor run by the National Oceanic and Atmospheric Association, with simultaneous weather station measurements. This allowed the group to map out the relationship between ground measurements and satellite measurements so that they knew roughly what the satellite temperature would be when the thermometer at a weather station registered -5 degrees Celsius, for example. The team used this relationship to extrapolate what the satellite would have recorded over the whole continent had it been in orbit when the weather station record began in 1957. Once the group reached the period when the satellite was in orbit, they checked the extrapolated values against the actual measurements to confirm that the method was sound. In the end, they generated a 50-year record of temperatures across Antarctica. Their work was published in the January 22, 2009, issue of Nature. Hansen, K. (2009, January 22). Satellites confirm half-century of West Antarctic warming. NASA. Accessed January 22, 2009. Steig, E., Schneider, D., Rutherford, S., Mann, M., Comiso, J., and Shindell, D. (2009, January 22). 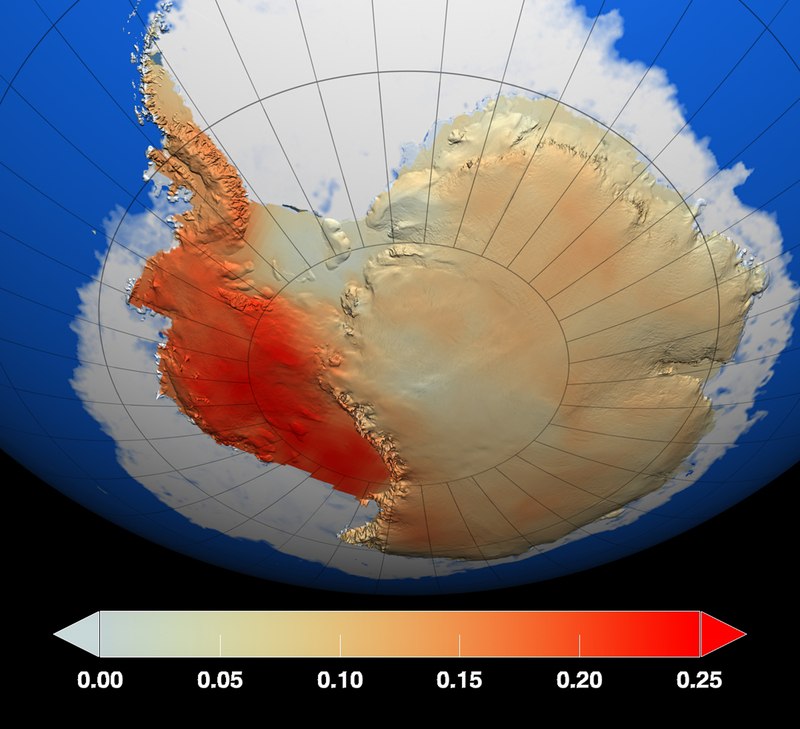 Warming of the Antarctic ice-sheet surface since the 1957 International Geophysical Year. Nature, 457, 459-463. doi:10.1038/nature07669. Steig, E. (2009, January 21). State of Antarctica: red or blue? RealClimate. Accessed January 22, 2009.